The first time I tried to use Twitter ads to grow my email list, I felt like I was stepping up to the roulette table and putting it all on red. Yes, I’d earned money from this email list in the past, but plunking down my hard-earned cash in the hopes of increasing my future earnings felt like a big gamble. After starting the campaign, I kept a close eye on my Twitter Ads dashboard, and the early results seemed reassuring. It was working! People were clicking my ads by the hundreds! But then I checked my MailChimp account, and something seemed very, very wrong. Instead of the dozens of new email subscribers I expected, I found just a small handful. So I started asking around. I checked with friends. I contacted the company that made the landing page software I was using. I even contacted Twitter. As it turns out, the culprit was simple conversion math. Why would someone click on my ad and then not sign up? When I created the ads, it seemed pretty simple: I was just asking people to click on a link and enter their email address. Here’s what I didn’t factor in to my thinking: According to the latest stats from Twitter, 78 percent of active Twitter users are on mobile devices. And the standard email list opt-in process is pure P-A-I-N on an iPhone. 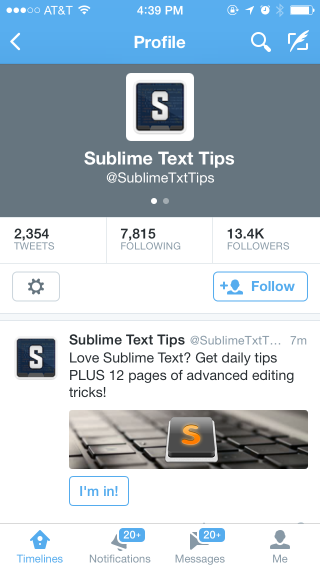 78% of Twitter users are on mobile devices, and standard email opt-in forms are pure P-A-I-N on an iPhone. First, you click the link, which bounces you over to a browser. You wait while the page loads, probably for several seconds because you’re in a spotty coverage area. As the form starts to appear, you cross your fingers and hope it’s optimized for mobile viewing. It’s not, so now you’re pinch-zooming and scrolling to find the email input form. Then you peck out your email address (twice! Thanks for nothing, autocorrect!) on that tiny keyboard. Then more pinch-zoom-scroll to find the Submit button. And as it happens, most people just don’t want to be on my email list that badly. But what if people could instantly subscribe with a single click? That’s what you get when you use Twitter’s lead generation cards. Lead gen cards are awesome for several reasons. First, they eliminate the friction of navigating to a separate landing page, filling out the form and opting in. Everything happens right there in the viewer’s Twitter feed. Second, they improve the quality of the email addresses you collect. People tend to use their best email address when signing up for social media accounts, so you’ll get fewer “disposable” email addresses. Third, because each card includes a large image, they stand out in crowded tweet streams. Best of all, you can use lead gen cards for free. 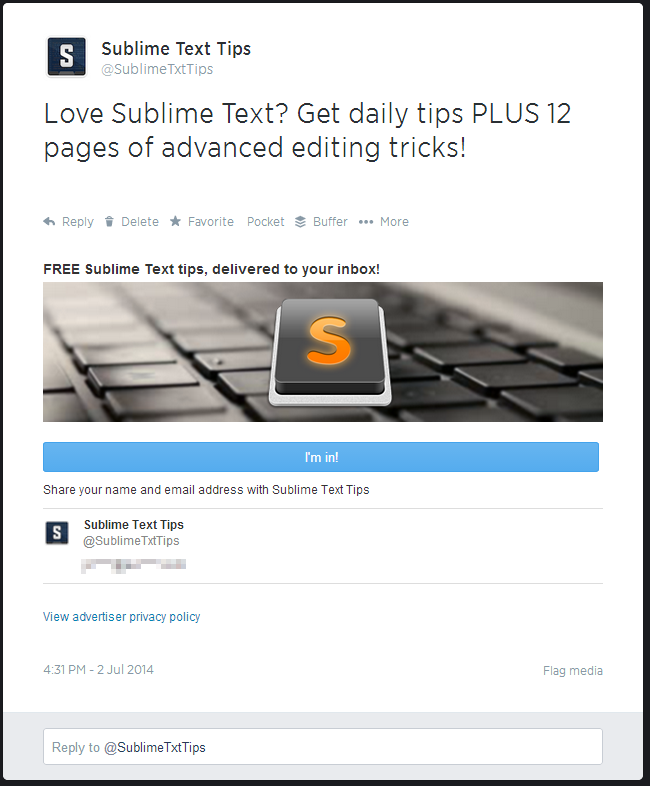 While they do work well in ads, you can easily send them out in regular tweets without paying a dime. How do you set up Twitter lead gen cards? Lead gen cards aren’t difficult to create, but there are a few steps involved in making one. For this walkthrough, I’m going to focus on setting up a lead gen card to send new subscribers to MailChimp, but most other email providers will also work. 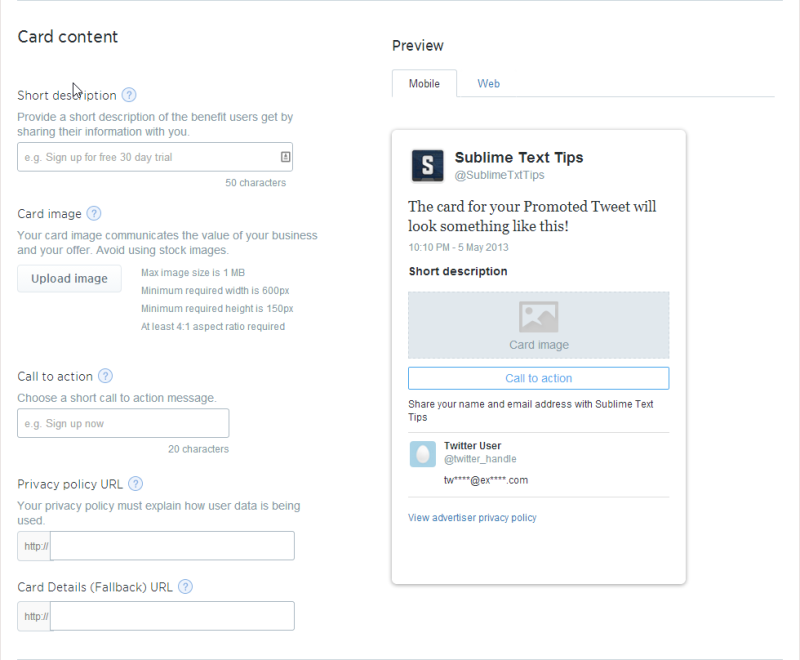 You create Twitter cards through the Twitter Ads dashboard, so before you can create your first lead gen card, you’ll need to open an account with Twitter Ads. To get started, just visit the Twitter Ads site and use your Twitter ID to sign in. You’ll also need to enter a payment method before you can access the card creation tool. Don’t worry–Twitter isn’t going to charge you unless you decide to run ads in the future. 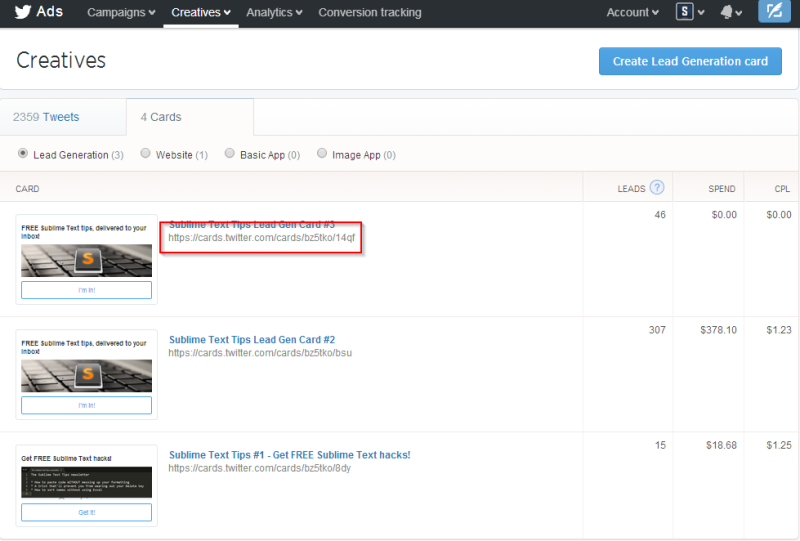 From the Twitter ads dashboard, click the Creatives item in the site navigation, then click Cards. The Create Lead Generation card page includes fields that control your card’s appearance and connect it to your email provider. To begin, you’ll need to fill in the Short description field to provide a headline for your card. The headline should make it clear that you’re asking the viewer to opt in to an email list while also offering something that will benefit them if they choose to sign up. Next, you’ll need to choose and upload an image. The image displayed on your card will have a major impact on the card’s success, so pick something that’s relevant but eye-catching. Twitter is picky about the height-to-width ratio of the image you upload. I’ve found it’s easiest to just go with the suggested size of 150px high by 600px wide. These first three elements–the headline, the image and the call to action–can have a major impact on the number of opt-ins you get from the card. Long term, it’s a good idea to create multiple cards and test them against each other to find out what your audience responds to. Now that the visuals are squared away, there are just a few behind-the-scenes items left to take care of. The Card Details (Fallback) URL field is optional. Twitter uses this URL to redirect the user when they click on your card from an app that doesn’t support Twitter cards. If you have a traditional opt-in landing page, enter the URL here. In the Destination URL settings section, you have the option of entering a thank-you page URL or post-submit message. If you complete the Destination URL field, anyone who clicks the submit button will be redirected to the page you specify. I set my destination URL to point to the same thank you page that I use for my other opt-in forms. Finally, enter a name for your card in the What would you like to name your card? 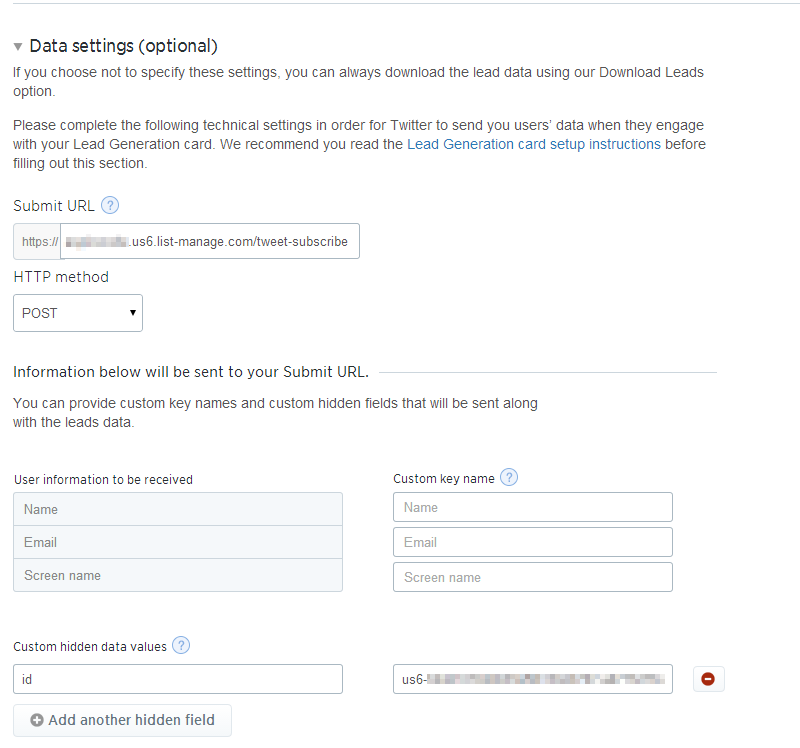 field, and select the checkbox to agree to Twitter’s data use policy. Your card is ready to go, but don’t click Create card just yet, because we still need to hook it up to your email provider. The Data settings section is where you connect your card with your MailChimp account. To wire everything up, you need to provide Twitter with two pieces of information: the URL to use when submitting new subscribers, and the ID of the MailChimp list you want your subscribers added to. The MailChimp support documentation has detailed, step-by-step instructions for integrating your account with Twitter lead gen cards, but here’s a quick overview. First, log in to your MailChimp account and navigate to your list. Click the Signup forms tab, then click the Form integrations menu item. 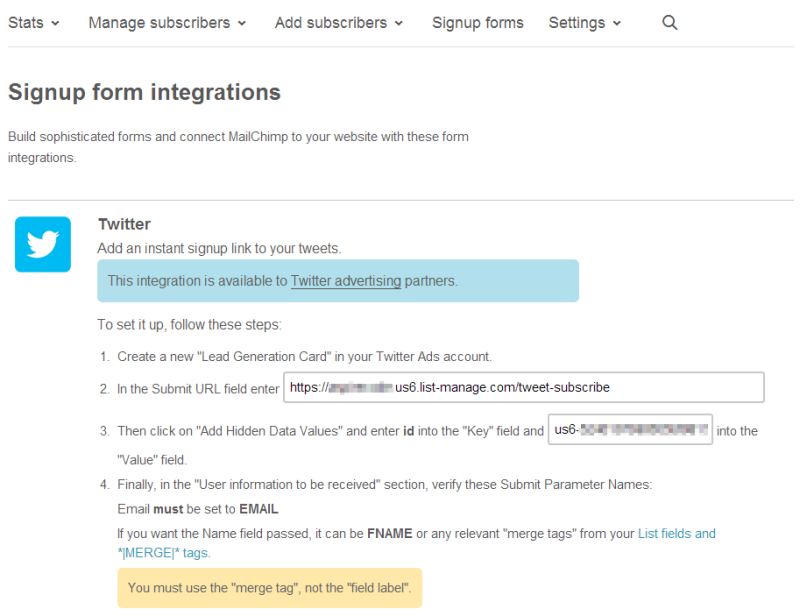 Click on Form integrations, then select Twitter from the list of integration options. Copy the URL displayed on the MailChimp integration page and paste it into the Submit URL field in your Twitter lead gen card. Next, click Add hidden field. A new row appears with Key and Value fields. Enter id in the Key field, then paste the list ID from your MailChimp integration page into the Value field. Under HTTP method, confirm that the POST option is selected (it’s the default). 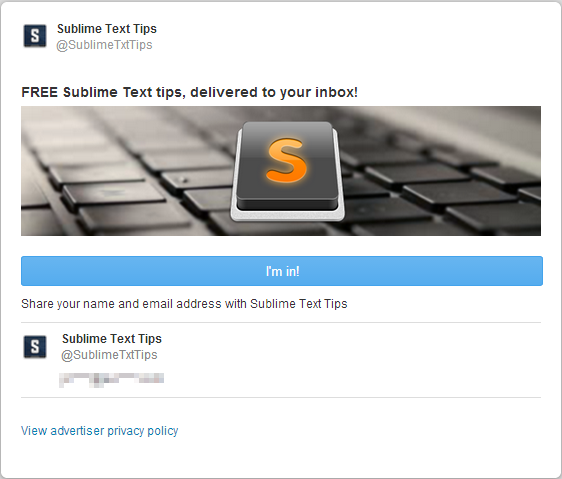 When you click Create card, Twitter confirms that you’ve set up the integration correctly by making a test submission to your email list with the email address you have associated with your account. If you weren’t subscribed to your own list before, well congrats, you are now! It’s a good idea to check your MailChimp account to make sure the test submission went through as expected. Using your new card is just a matter of composing a new tweet and pasting the card’s URL at the end of your tweet. The card’s URL is displayed on the Cards tab under Creatives. How well do lead generation cards work? 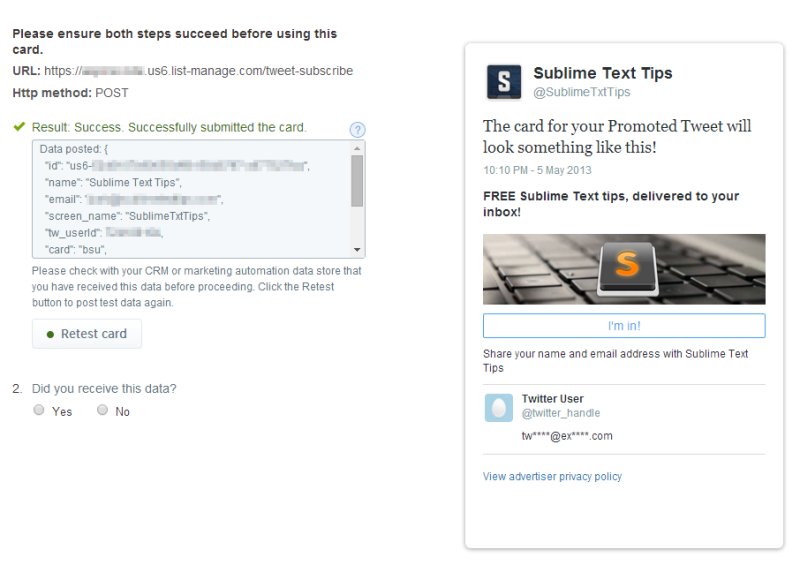 To get the Twitter feed screenshots for this article, I posted a single tweet with a new lead gen card from my @SublimeTxtTips account, which currently has around 13,400 followers. It wasn’t intentional, but that tweet turned out to be a great demonstration of the power of lead gen cards. Here’s what happened. This particular tweet netted 6 new subscribers. Not a huge number, but I send similar tweets every couple of days, and I get a steady stream of new subscribers joining my list. When the lead gen card went out, it was the second newsletter-related tweet of the day. Even given that disadvantage, it crushed the opt-in form, bringing in 47 new subscribers in a matter of minutes. Needless to say I’ll be promoting my newsletter exclusively through lead gen cards in the future. In addition to helping you convert followers into email subscribers, lead gen cards also make killer ads. Using a lead gen card in a promoted tweets ad campaign is simply a matter of including the card’s URL in the tweets you’re promoting. When you’re paying for clicks, Twitter cards provide an added bonus: They tend to generate insanely high engagement rates compared to standard tweets. People love to click on these things, and the more clicks you get, the less you pay per click. In general, an engagement rate of over 2 percent is respectable when you’re advertising on Twitter. This ad earned a 2.35 percent engagement rate, and I paid an average of $0.18 per click. A decent result. The best-performing card had a sky-high engagement rate of 11.18 percent, and I was only paying about $0.03 per click. That’s just about as low as it goes on Twitter. That campaign isn’t typical–I’ve seen engagement rates in the 3 to 8 percent range on most of the other campaigns I’ve run using lead gen cards. But dollar for dollar, lead gen cards outperform plain text tweets every time. Using Twitter lead gen cards, I’ve found that I’m typically able to secure new subscribers for between $0.75 and $1.50 for this particular list, and I could likely get that cost per subscriber lower with some testing and experimentation. Because Twitter lead generation cards make signing up for your email list a one-click operation, you’ll collect more email addresses than you would using a traditional opt-in landing page. That ease of use, plus extra visual pop that the card provides, makes Twitter lead gen cards a powerful addition to your list-building arsenal. Give them a shot today, then let us know how it went in the comments below. Josh Earl is SitePoint's business editor and a programmer, writer and entrepreneur. He runs The Sublime Text Tips Newsletter and blogs about marketing and entrepreneurship at JoshuaEarl.com.